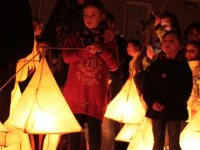 A little film of a lantern procession which took place in Haverfordwest on 29th October 2011. Most of the lanterns used in the procession were made during free lantern workshops for young people run by ’space-to-create’. I did not intend to film the event but it looked so beautiful that i just grabbed a camera. I did not have time to set up so it is shot on a very wobbly handheld Canon 7D with a Sigma nifty fifty. The music is a quick ‘knock up’ Garageband soundtrack! Despite the shooting errors it still manages to capture the warm magical glow of a very charming event. The event was supported by the Arts Council of Wales and the Milford Haven Port Authority. It is part of the ‘takingpartwest’ programme which is a spacetocreate.org.uk initiative.